The Roma medical Shoprider Lugano is a standard mid-wheel drive powered wheelchair capable both indoors and out. Large wheels and articulating castor beams give the Lugano good outdoors performance, while the mid-wheel drive keeps it manoeuvrable when used inside. The captain’s seat provides ample comfort for those needing a standard seat, and comes with a headrest too. The Lugano features large 14 inch drive wheels, much bigger than those found on most other powerchairs, and this helps it perform outdoors, as well as giving a smoother ride. Articulating front and rear axles complements this, as well as the pneumatic tyres. This combines to give the Lugano better performance outdoors than more basic mid-wheel drive powerchairs such as the Jazzy Select 6. The Shoprider Lugano powerchair is a stable powerchair which offers lots of features .The Shoprider Lugano powerchair comes with a captain seat as standard which has an angled adjustable back. Seat belt and headrest also included. The seat base itself is height and angle adjustable. The Luganos’ front and rear axles are articulated which gives a more comfortable drive. The Twin motor mid-wheel drive system enables the machine to turn in a 360 degree circle within its own length. Armrests are height and width adjustable and furthermore the footplate is also height adjustable. 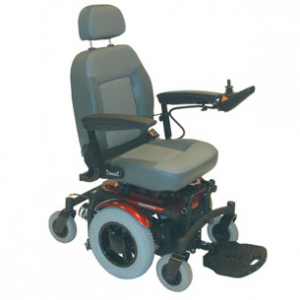 Shoprider’s Lugano powerchair can also be dismantled for transporting or storing.